There’s no reason to demonize inheritances. However, nothing about LARGE inheritances is right or righteous. Yes – per Proverbs 13:22 – – good men leave inheritances. But PERFECT men (per Jesus) sell everything and give it to the poor. Everyone only “plans” to leave the largest inheritance for their children by default because there is no other option presented to us. To perpetuate the concentration of wealth into the hands of a couple offspring? Or to use what little you have, to raise the MEDIAN wealth of historically disadvantaged people in this country? 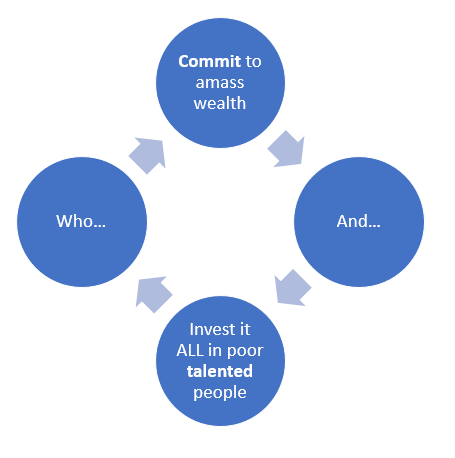 – Is wealth concentration the problem, or the solution? – to WHICH do you want to contribute – the problem or solution? Would you personally do what you want others to do? One doesn’t have to look far to hear complaints about the perils of wealth concentrated into the hands of a few people. But when those same persons are presented a choice to distribute their prospective wealth to talented disadvantaged people, far too many balk at the idea. It’s awfully hypocritical. …for us to expect wealthy [white] people to distribute their wealth to low wealth Americans, but even “we” won’t do it. …for us to lament that “they” are sequestering wealth behind trusts, but even “we” won’t commit to distribute a sizable portion of what we have as a philanthropic investment into a talented American from a low wealth household. Millions have lived and died waiting for an opportunity. Life is short. For the BRIEF 100 or so years we have on Earth, what exactly do we want the world to look like in the couple hundred to come thereafter? Unless you independently – without any acts of Congress – choose to distribute a large portion of your wealth, then tens of millions (even hundreds of millions) more in the coming generations will live and die waiting for ‘equal opportunity’. It comes down to your personal choice and goals: either you want to close the wealth gap or you don’t. Our actions and decisions decisively elucidate an underlying moral code. To benefit the greatest or fewest number of people? Do we want the median wealth of economically disadvantaged Americans to rise? It’s ok for your answer to be no. If however, by chance, the answer is yes, then what are you willing to personally do about it? Would you be willing to personally take on poverty elimination in America? Not just the talented tenth. Not just your kids. But as many of them as you possibly can. But if you want to reduce the painful MEDIAN wealth gap by race, what is your plan to make it happen? All this depends on your personal goals and vision for what America should look like after you’re gone. Do you look at wealth concentration and the wealth gap as the problem or the solution? Do you want to perpetrate the problem OR commit yourself to being part of the solution? If you personally know the pain of poverty, are you compelled to ensure fewer people feel that pain? Shifts in legislative policy are coming, regarding estate taxes and rules on passing wealth to children. Most foresee, that they are not being written to encourage wealth distribution to low wealth people. This is all the more reason why now more than ever, we would personally and voluntarily choose to do differently only IFF you want to positively affect the underclass economically. Proverbs does encourage good people to leave an inheritance to their children’s children. But can we be more thoughtful about exactly what that looks like? Proposed shifts to corporate and estate tax code only enables greater small business investments. In the context of the model for which we are advocating right now, the proposed legislation would provide young talented American people with yet another reason to own a C corp – beyond the reasons already established – and any prospective HNW people could make investments into those businesses. It’s a long term win-win for everybody. With GDP at all time multi-century lows, this has tremendous potential. In terms of the potential for the proposed estate tax shifts, these shifts put the voluntary responsibility on HNW people to do as they wish with their estate. If you WANT to make $60k investments using a $300M estate into 5,000 C corp’s owned by single owner talented economically disadvantaged Americans, then you may have more liberty to do that. So, HNW people get the liberty to do MORE of what they independently want for the good of American society, since governments have largely been unwilling and/or unable. “What keeps black Americans so poor?”, Bloomberg asks. When HNW people of any ethnicity choose to concentrate wealth, this is what keeps Americans poor. The Holy Bible may or may not be your source for a code of ethics. But coincidentally, the guy people claim was named Jesus, shared valid principles on economic development that are still relevant today. The model is quite simple…. THAT is how you to eliminate poverty. The choice to engage this simple methodology is completely yours to make.